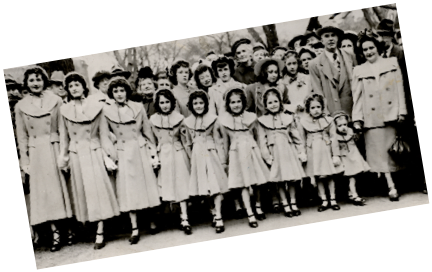 Cynosure of all eyes in the Easter parade along Commonwealth Ave., was the ONeil family of Jamaice Plain, including Mr. Daniel O’Neil (in rear wearing felt hat, oldest brother, Larry to his left, daughters Jane 12, Barbara, 11, Diane 9, Maureen 7, Evelyn 5, Virginia and Mary 12 months. 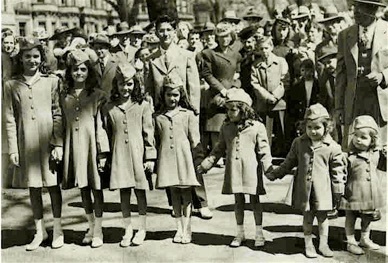 From left to right and uphill are the five prettiest sisters in Boston’s Easter parade. 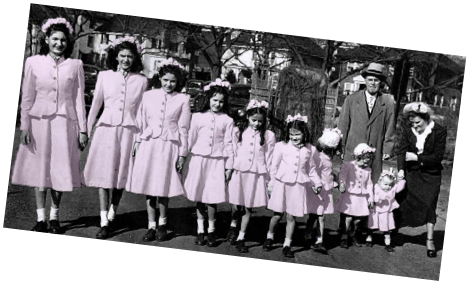 The day took an added sheen when the O’Neils of Old Harbor Village, South Boston, stepped over to Commonwealth Avenue and went hand to hand, Evelyn, 2 pointing the way for Maureen 3, Diane 4, Barbara 6 and Jane, 7. They are the daughters of Mr. and Mrs. Daniel O’Neil. 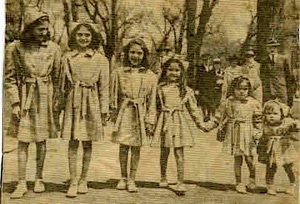 During the morning hours the wind carried a sharp bite, but it failed to spoil the annual parade.....the five darlings of the procession, children of Mr. and Mrs. Daniel O’Neil. Oldest and only son, Lawrence, then five girls, Jane, Barbara,, Diane, Maureen and Evelyn. 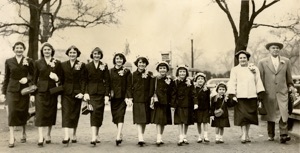 Mighty proud and happy were the O’Neil sisters, daughters of Mr. and Mrs. Daniel O’Neil of Jamaica Plain as they participated in the Easter Sunday fashion parade along the Commonwealth Ave. mall. 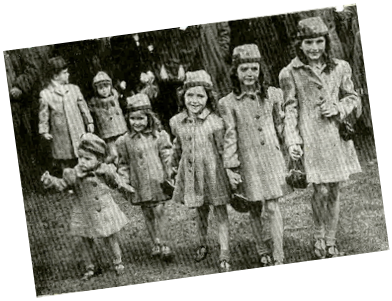 Left to right, Jane, Barbara, Diane, Maureen, Evelyn and Virginia. 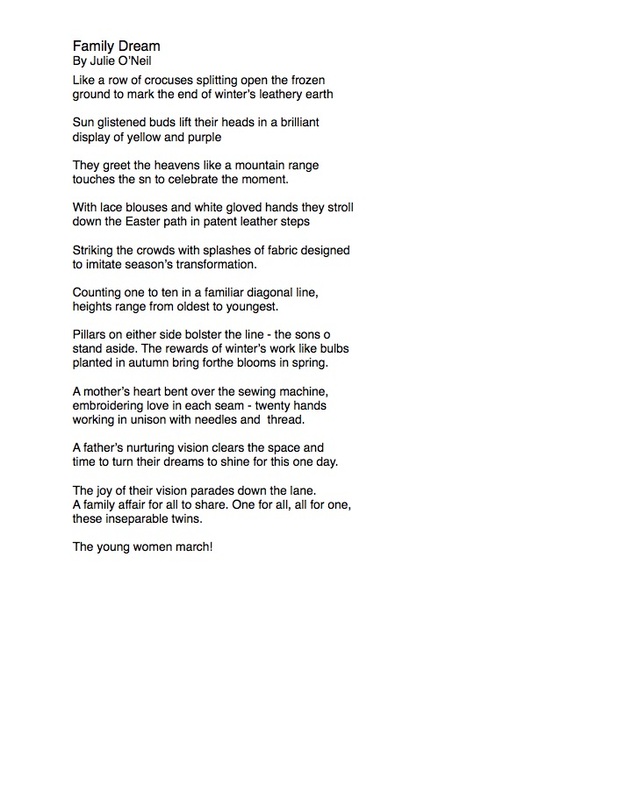 Their bright colored garments had a kaleidoscope effect in scenery Each one’s costume was a duplicate of the other. 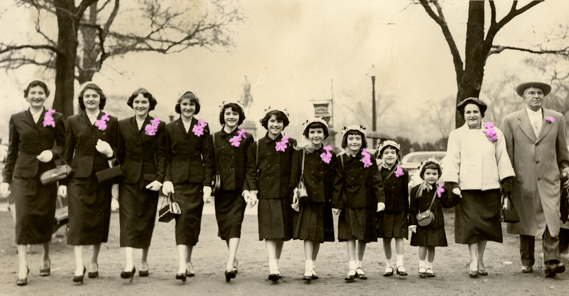 MRS. O’NEIL’S CHICKS were among the proudest--and cutest--girls in yesterday’s Easter Parade. 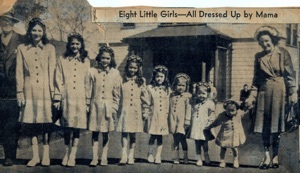 Left to right, Mrs. O’Neil of 25 Horan way, Jamaica Plain, and her daughters Virginia, Evelyn, Maureen, Diane, Barbara and Jane. 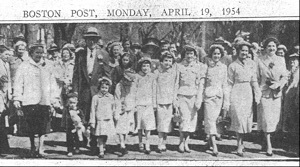 Cynosure of all eyes in the Easter parade along Commonwealth Ave., was the ONeil family of Jamaica Plain, including Mr. Daniel O’Neil (in rear) wearing felt hat, daughters Jane 12, Barbara, 11, Diane 9, Maureen 7, Evelyn 5, Virginia and Mary 12 months. 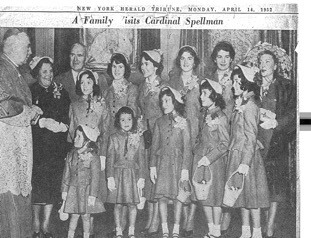 Seven girls and “Yes, Mrs. O’Neil says, they have a boy” says Mrs. O’Neil, Larry, age 14 in back of the sisters. 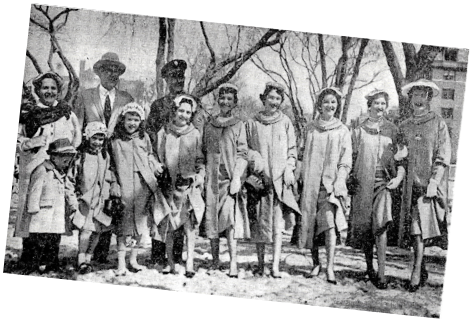 Proudest marchers in the Boston, Mass., Easter parade were Mr. and Mrs. Daniel O’Neil and their eight daughters who range in age from 13 years to 15 months. 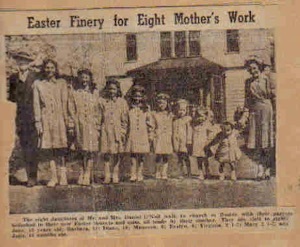 The eight little O’Neils were dressed in brand new Easter suits and bonnets And the present clothes shortage didn’t bother Mrs. O’Neil--she made all the outfits herself. 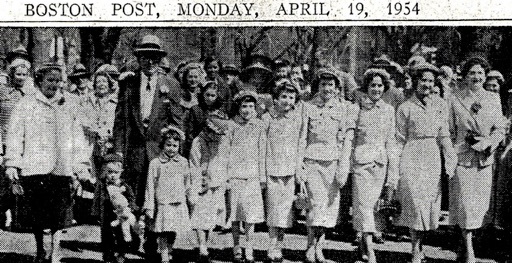 Mr. and Mrs. Daniel O’Neil, left, of Jamaica Plain, and their 10 children, as they appeared yesterday in the Easter Parade, right to left, Danielle 1, Julie 3, Mary 4 Virginia 5 Evelyn 8, Maureen 10, Diane 12, Barbara 14, Jane 14, Lawrence 21. The O’Neil Family of Jamaica Plain, 11 strong, in Commonwealth Mall Parade. 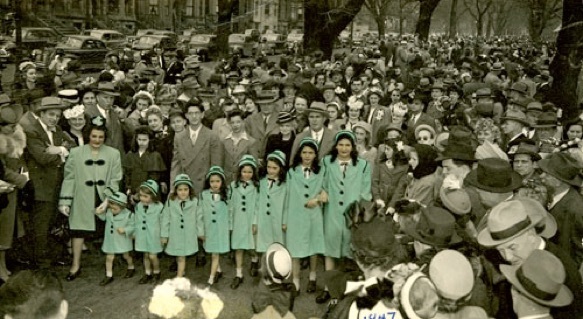 In matching aqua hats and bonnets, trimed with black braid and identical coats, eight O’Neil, Jamaica Plain, drew attention of hundreds as they marched along Commonwealth Ave. mall in traditional after-church Easter sunday fashion. Mars. 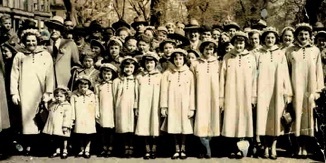 O’Neil is at left with Mr. O’Neil behind girls Brother, Lawrence paraded also, right of mother. There is also a three weeks old girl at home. THE 10 O’NEIL girls and their parents, Mr. and Mrs Daniel O’Neil pay respects to Msgr. Francis A. Burke at Blessed Sacrament Church, Jamaica Plain. 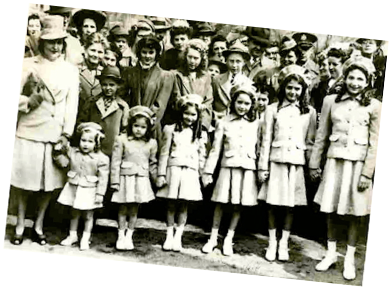 Left to right are Jane 17, Barbara 16, Diane 14, Maureen 12, Evelyn 10, Virginia 7, Mary 6, Julie 5, Danielle 3 and Celeste 1, held by mother. The only and eldest O’Neil son, Larry, is in Germany with the United States Army. 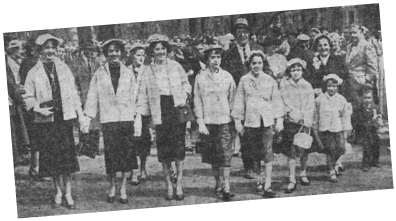 TEN DIVIDENDS-On Commonwealth Ave. in Boston yesterday the Daniel O’Neils of Jamaica Plain, Mass, escorted their 10 pretty daughters in their own private Easter parade. 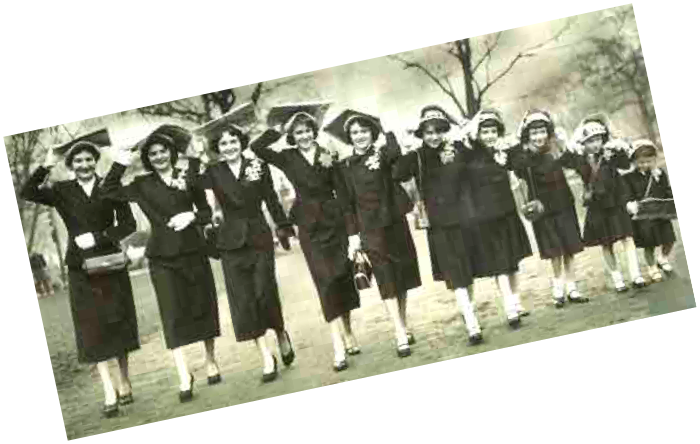 they are from left to right, Mrs. O’Neil , Frances 2, Danielle 4, Julie 6, Mary 7, Evelyn 11, Maureen 13, Diane 15, Barbara 17, and Jane 18. 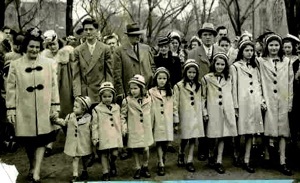 Mrs. O’Neil and daughters wore mint green pyramid coats and yellow straw hats trimmed with yellow flowers. 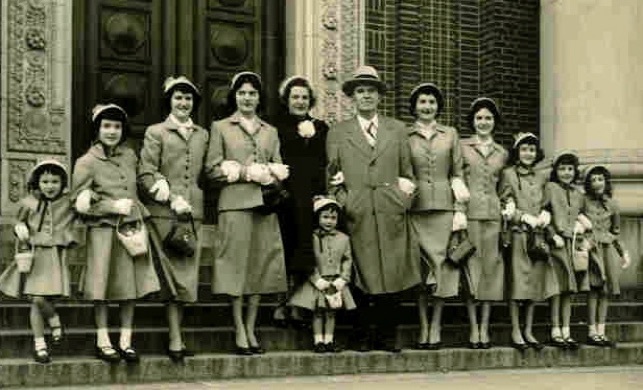 In the left center behind his family is Mr. O’Neil wearing a grey hat and a boutonniere. The girls have a brother, Lawrence, who is serving in Italy with the U. S. Army. 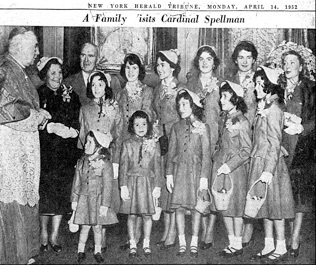 Cardinal Spellman greeting Mr. and Mrs. Daniel O’Neil and their ten daughters in the Cardinal’s residence after mass at St. Patrick’s Cathedral yesterday. Singer Jessica Dragonette (right) accompanied the family on the visit. 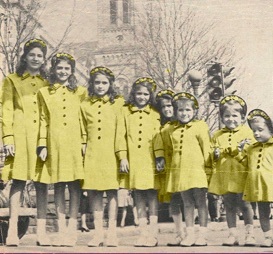 The girls are, left to right, front row: Frances, three; Danielle, five; Julie, seven; Mary, eight, and Virginia, nine. 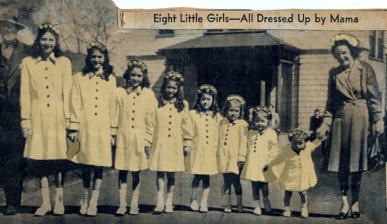 Back row: Evelyn, twelve: Maureen, fourteen; Diane, sixteen; Barbara, eighteen, and Jane, nineteen. The O’Neils live in Jamaica Plain, Mass. and came to New York for the Easter Parade for the first time this year. A rainy Easter Sunday doesn’t bother Frances, youngest daughter of the ten O’Neil sisters, as she takes a glance at the newspaper while on the stroll down Commonwealth Avenue. 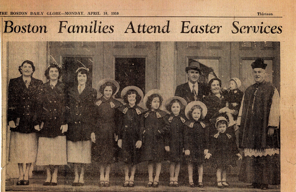 It looked like a junior-size dress factory at 24 Wyman Street, Jamaica Plain, five weeks ago when Mrs. Daniel J. O’Neil set to work making ten complete Easter outfits for the children, plus a topper for herself. 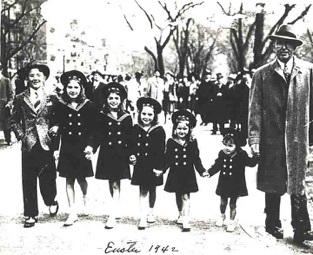 Young Danny boy, age 2, is marching in his first Easter Parade in a navy blue suit, made by Mrs. O’Neil, clutches his teddy bear. Among the throngs parading on Commonwealth Ave. mall was the O’Neil family of Jamaica Plain. Strolling down Commonwealth Ave. mall in new Easter clothes are nine daughters and two sons, Danny, the youngest and Lawrence, the eldest, an army sergeant, children of Mrs. and Mrs. Daniel O’Neil of Jamaica Plain. 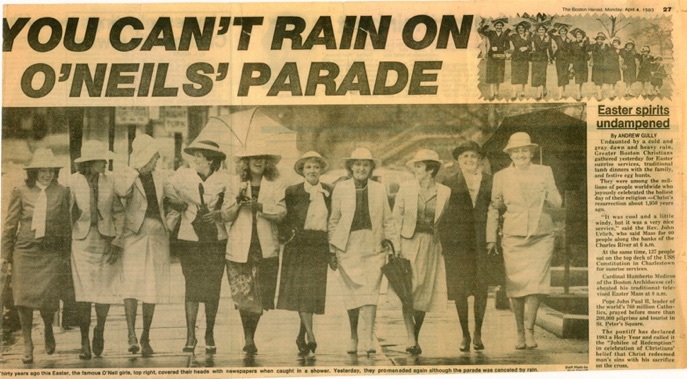 Thirty years ago this Easter, the famous O’Neil girls, (top right), covered their heads with newspapers when caught in a shower. Yesterday, they paraded again. display of yellow and purple. touches the sun to celebrate the moment. heights range from oldest to youngest. planted in autumn bring forth blooms in spring. working in unison with needles and thread. time to turn their dreams to shine for this one day. The joy of their vision parades down the lane.